Tried out this recipe this afternoon. I tried out different shapes other than the peach shape. 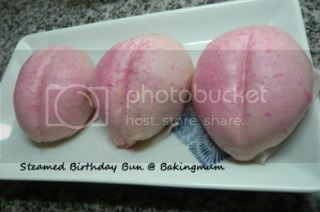 Usually for the older generation, whenever an elderly person celebrates his or her birthday, you can usually find this type of peach bun as it symbolises longevity. I have also shaped some into rabbits and porcupines. 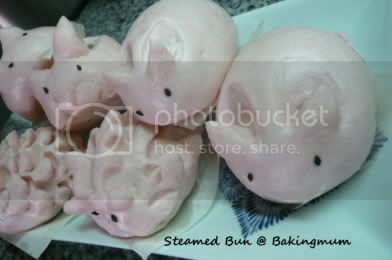 But then the rabbits after steaming became so fat. Hahaha ... 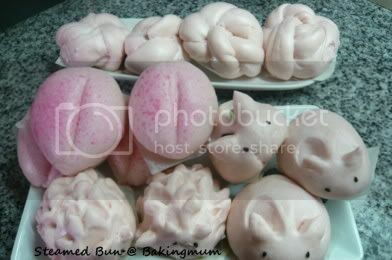 Since I have not enough lotus paste, I made some flower bun with the plain dough. This type of steamed flower buns go very well with food like chilli crab or steamed fish with sweet and sour Thai chilli sauce whereby you can use the buns to dip into the sauce. Oh so yummy. 1. Divide white lotus paste into 20g each. Roll into a ball and keep aside for later use. 3. Measure the dough into 30g each. Roll dough out and wrap with the white lotus paste. Make sure it is sealed properly and shape it into a peach shape. 4. Put a piece of paper underneath the shaped bun and leave it aside to rise for 30 mins. 5. Steam over high heat for 6 mins. Remove and spray with pink colouring on top. the rabbits are SO SO Cute! My son's favourite type of bun... thanks for the recipe! Creative mum came out with special rabbit shape bun. I like it. Hi BM, you are so creative... you make these buns look so fun! why do you think of kneading a rabbit? Is it easy to knead one? Just for the fun of getting some shape out of normal buns. Not difficult, you just need a pair of scissors to snip off the ears and the tail. And then stick 2 black sesame as the eyes. Just wanna ask, how many buns you manage to get out of 300g of flour? Also, regarding on the your recipe for Mango pudding, can I replace the 30 ml of milk with evaporated milk? Janice, I think I got about 16 pcs in total. Yes you can replace with evaporated milk if you want for the mango pudding. Are you the mum who bakes all these or bakingmum is a company baking all these delicious cakes. How could I get your answer. these are so cute to be eaten!! Hi Curious Mum, I am the bakingmum and all these are made by me in my humble kitchen. I do hold a full time job so this is just a hobby to me. May, I followed the recipe and used plain flour. 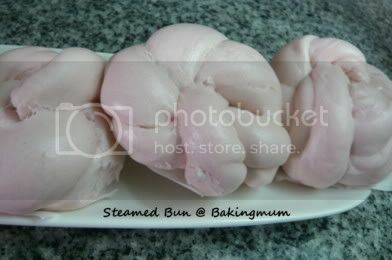 The texture is ok but as you know, this type of steamed buns must be eaten when it is hot and fresh from the steaming. After it has cool down, it will become hard. So before eating need to resteam them. Hi Beachlover, do try and let me know how it turn out for you. Regarding on the mango pudding recipe, is it necessary to add ice cream in? Yes need to add in ice cream to make it more creamy and taster. If you can find mango ice cream it is even better. hi all, wonder if anyone is interested in purchasing corrugated pizza boxes suitable for 12-inch pizzas. ideal for home pizza-makers. only S$0.45/box. free delivery in Singapore. desperately trying to offload 500 boxes that's piling at home. I've passed the pizza-making phase, and don't know what to do with hundreds of boxes. drop me a note at my blog if you are interested or are able to help (there's a picture of the box to give you an idea of the quality). thanks. hi, may i know if u have recipe for traditional cream cake? my boyfriend likes them a lot so i'm thinking of learning to bake it for him..
Hi Caren, what kind of traditional cream cake? You mean fresh cream cake? If it is, then you only need to get some non-diary cream and whipped it up and forst your cake. hi.. the kind like in the pics in the link below.. thanks! Caren, this one you can either do a fresh cream frosting or buttercream frosting. Hello baking mum, Thank you very much for wonderful recipes! We lived in USA and sometimes really difficult to get Asian food. I tried this one to make some for a friend's birthday and they loves it. I've just started a blog not long ago. Any advice for me? Hey baking mum! Where do you buy your lotus paste from? I've made chinese steamed buns before and never seems to get to that perfectly round surface that you have! Other steamed buns recipes requires you to proof the yeast first and then add in the flour and knead it until smooth and then let it rest for 40 mins or so. Is there any resting time for this dough? and do i have to proof the yeast? The only resting time is after you have shaped it before steaming. could u pls show me the method how to twist the flower roll. Its lovely! Thks!! May I know where can we get the lotus paste from?